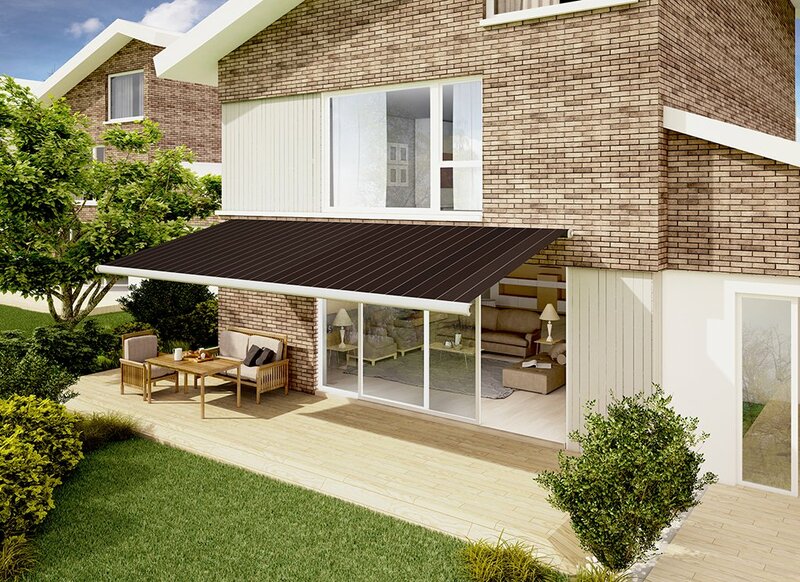 Explore a small selection of our stunning Cascade Awnings & Canopies range, visit our new showroom to experience our full range, you can book a free appointment here and enjoy a Free no-obligation quotation in the comfort of your own home. Alternatively call us today on your local number here. Domina is the perfect combination of classical style and innovative design. This appealing model features a host of new technology, proving it to be one of the top products in the cassette model range. Domina is extremely easy to assemble, adjust and install, ensuring the highest safety and quality standards. 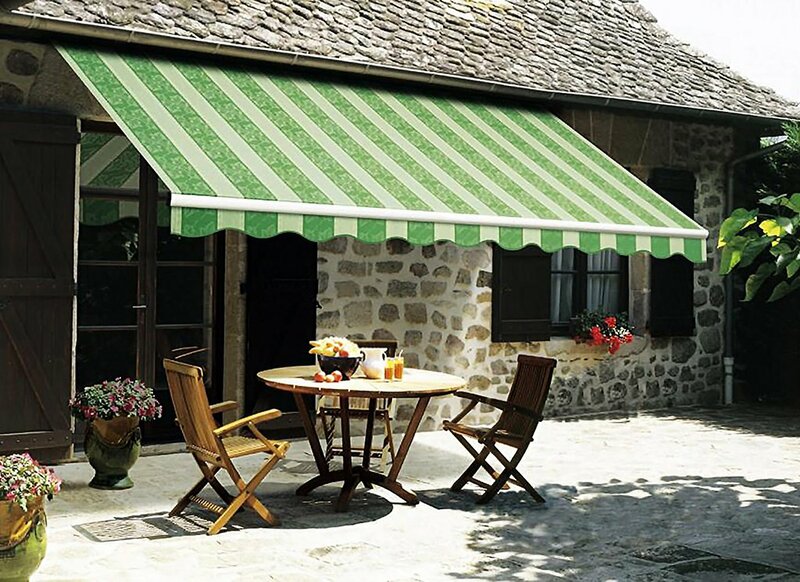 Relax under the shade of Zenith in the height of summer, knowing you can keep several degrees cooler under the Awning. However at night time you may find the temperature is actually higher underneath the Awning as heat is trapped under the covered area. 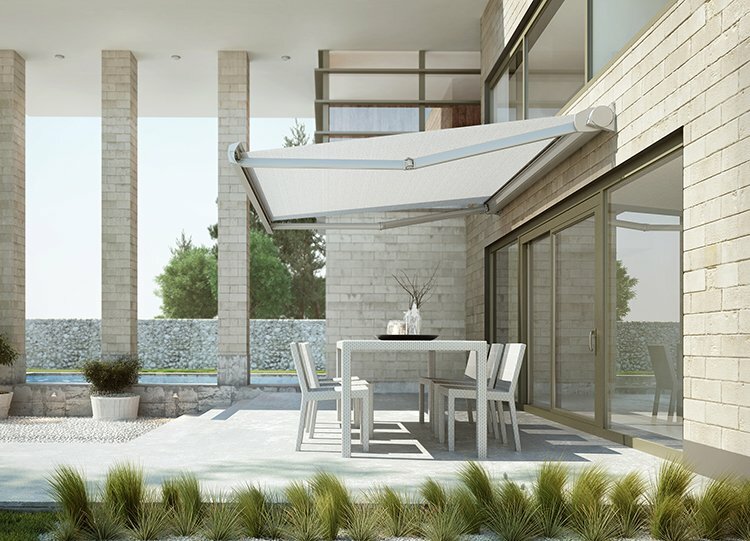 The Zenith retractable awning features a full closing box on a square bar, with tipping brackets that close the bottom bar even with the Awning fully extended. LED lights can now be installed in the arms of the Zenith as an option, to extend outdoor entertaining into the evening. Our top of the range model, a beautiful contoured fully cassetted system, Italian design at its best. This system features durable chain linked arms which make it suitable for larger residential and commercial applications up to 12 meters wide and 3.6 meters arm length. Despite its functionality the Armony remains extremely elegant in appearance. All the aluminium profiles are powder coated in white as standard to suit your individual taste other colours can be powder coated as an option. LED lights can now be installed in the arms of the Armony as an option, to extend outdoor entertaining into the evening. 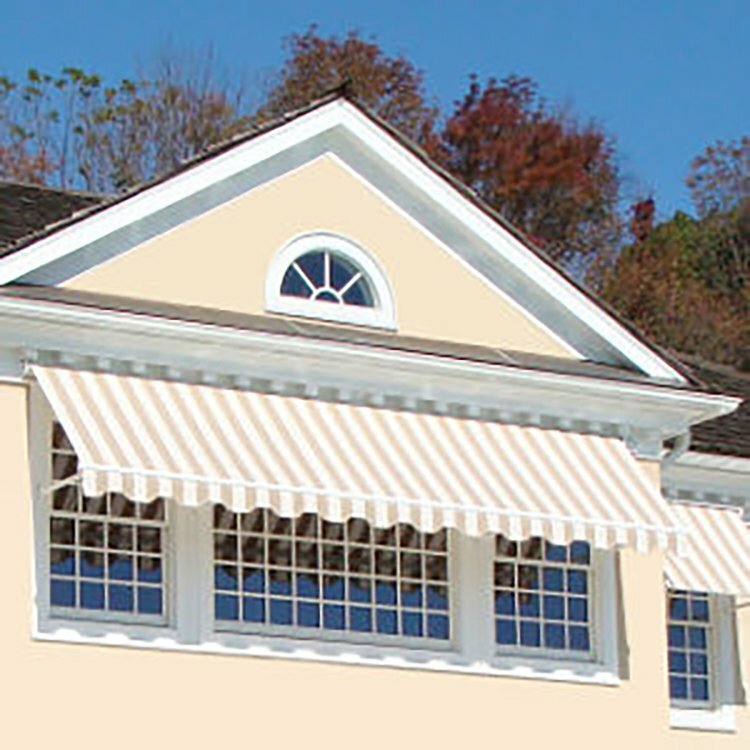 Our best selling Awning, a lovely, streamlined, fully cassetted Awning with a distinctive grooved front rail. 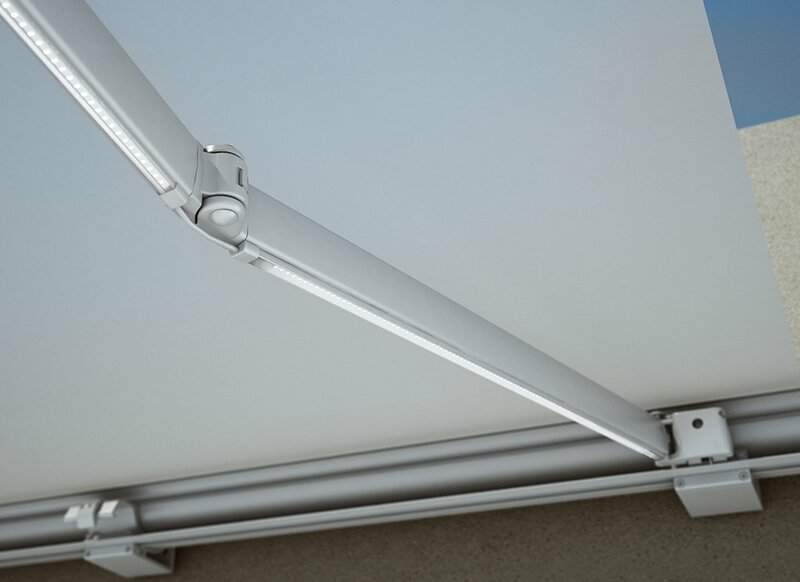 The base plus is a fully cassetted folding arm Awning with stainless chain arms and end fix brackets. Maximum dimensions are 5.5 meters wide by 3.1 meters arm length. 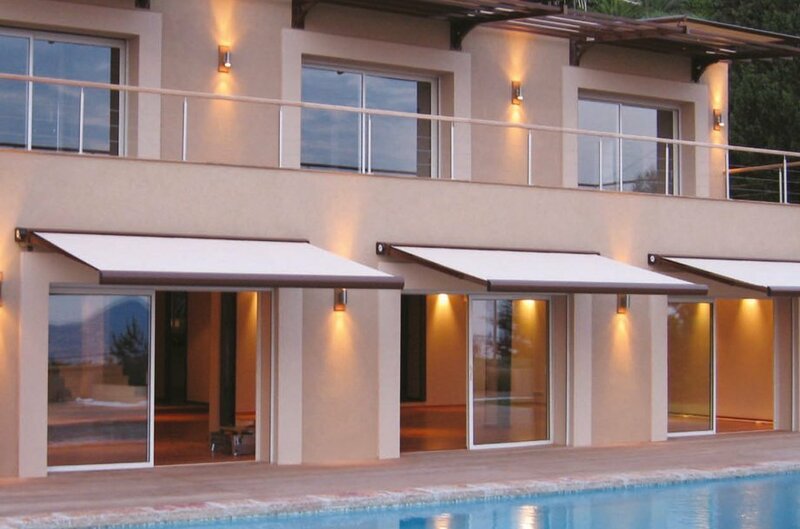 The arms and cover are fully enclosed in a cassette box for maximum weather protection when the Awning is retracted. 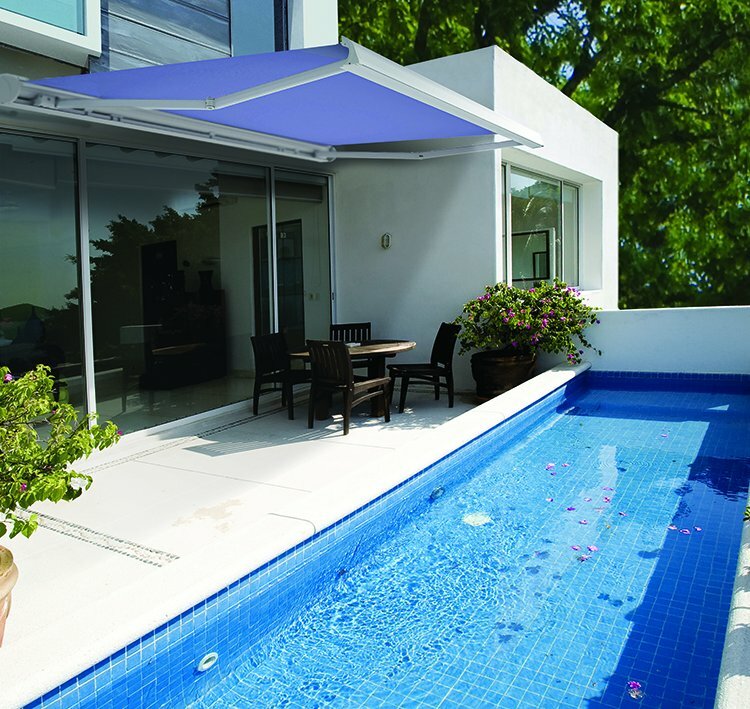 The Base Plus is the last word in simplicity when it comes to installation and adjustment, making it one of our best selling Awnings today. 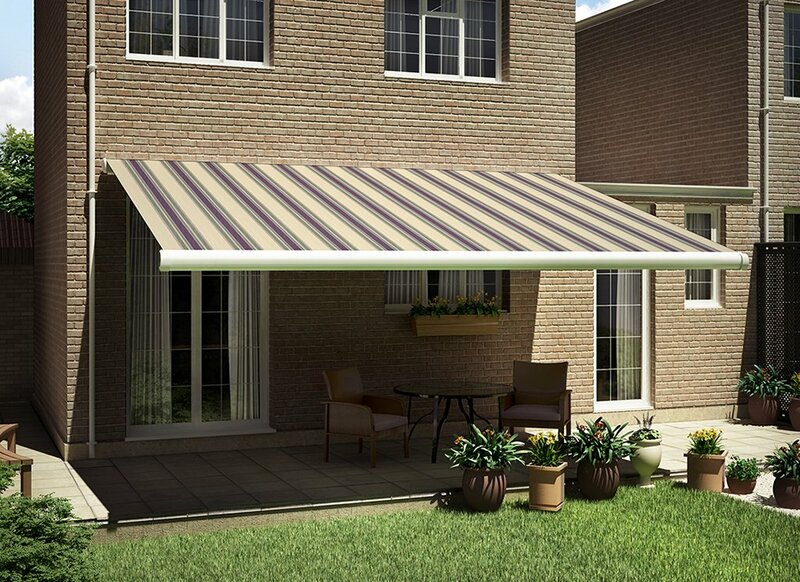 This Awning is the little sister of the Base Plus, with the same end fixing fully cassette system. 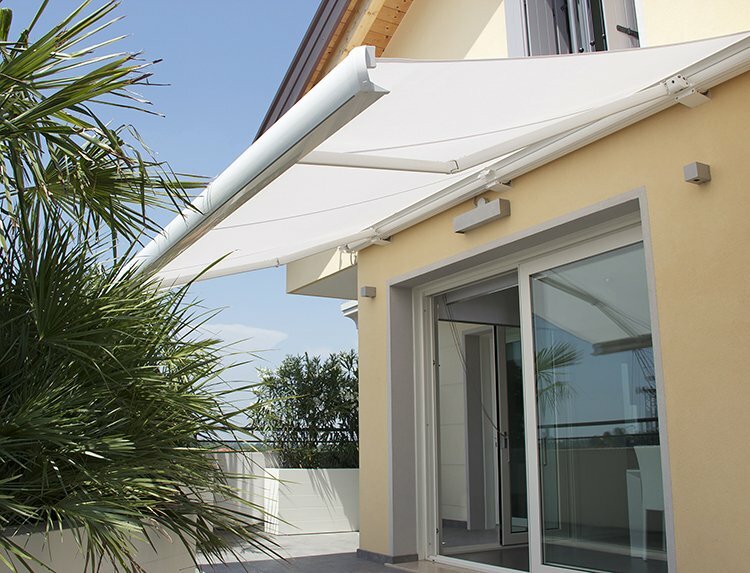 As well as providing shade for you and your family, an Awning can also protect precious plants from drying out during really hot weather. 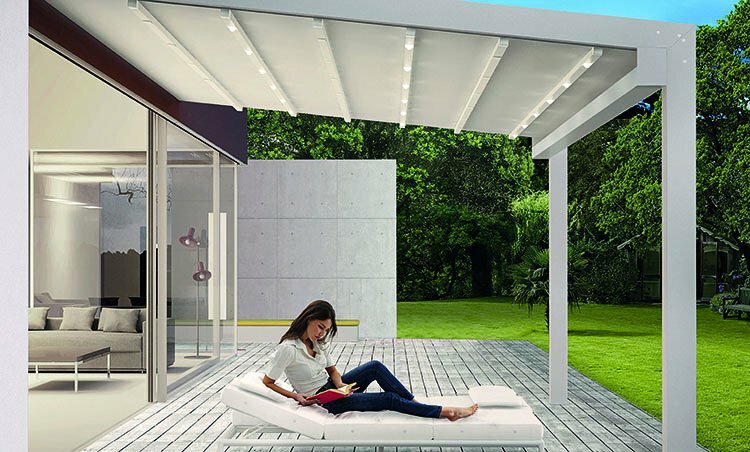 With the same simple installation , Base Lite is perfect for shading a more compact outdoor area while still extending your home. The size of the Base Lite makes it ideal for most occasions without encroaching on garden space. This model can span 4 meters in width and project up to 2.6 meters ( arm length). 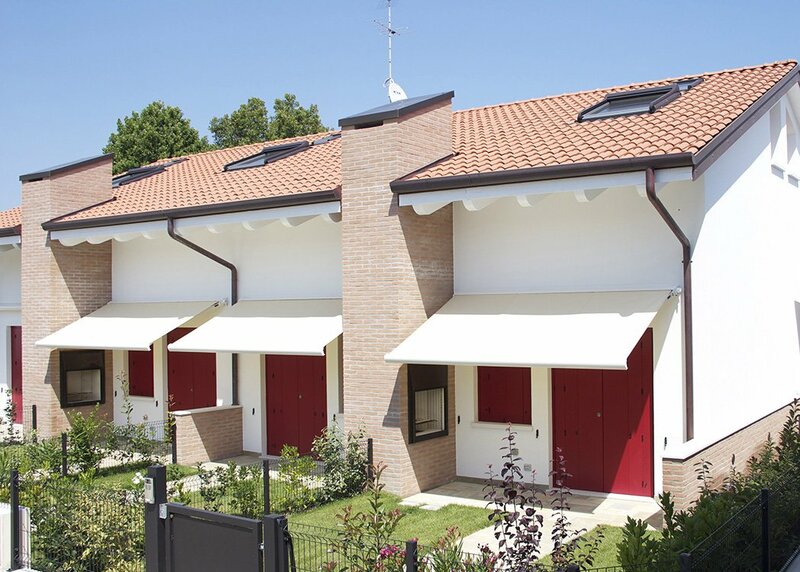 Italia is a lightweight but durable drop arm system suitable for residential or commercial applications up to 5 meters wide and 1.8 meters arm length. Arms can be wound down 90○ to afford maximum sun shading. 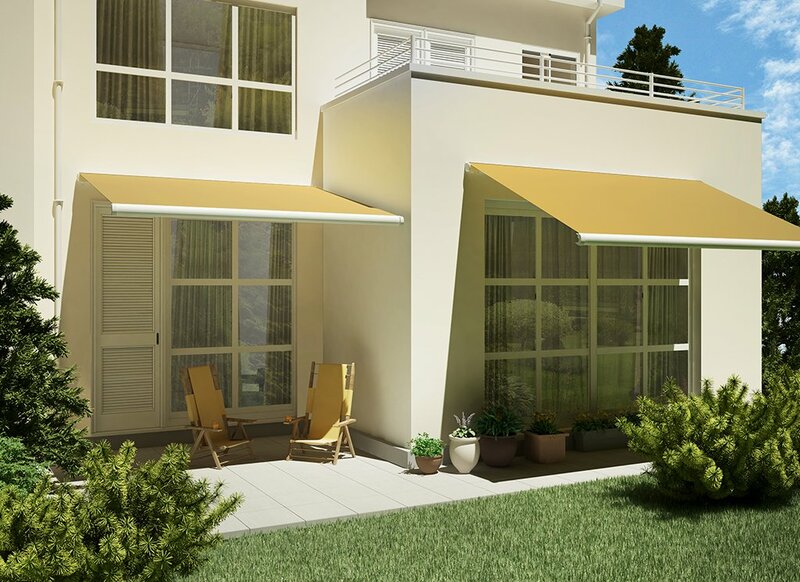 Drop arm awnings are particularly well suited to balconies, letting you enjoy the sunshine without the harsh glare. 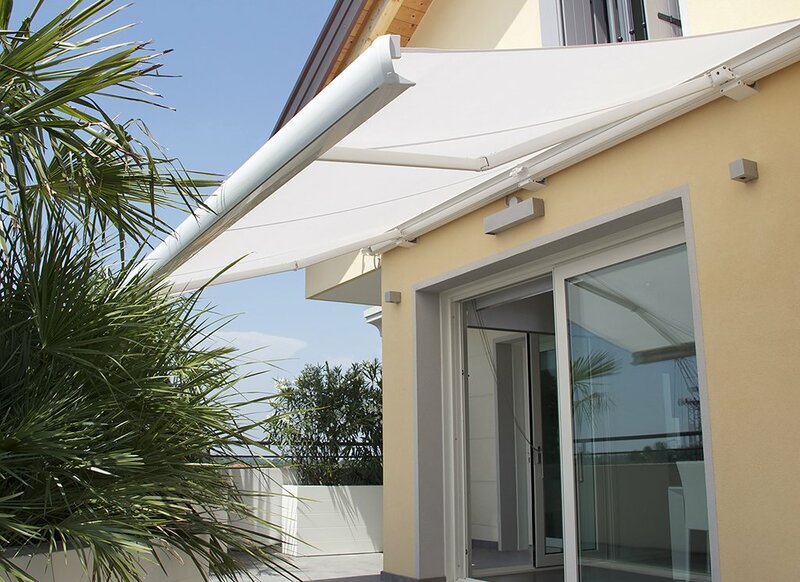 The Italia drop arm system is ideal for installations where the strength of the fixing surface is insufficient to bear the weight of a lateral arm Awning as the load is distributed between the arm brackets and the installation brackets. All the aluminium profiles are powder coated in white and the arms are spring loaded in their base. 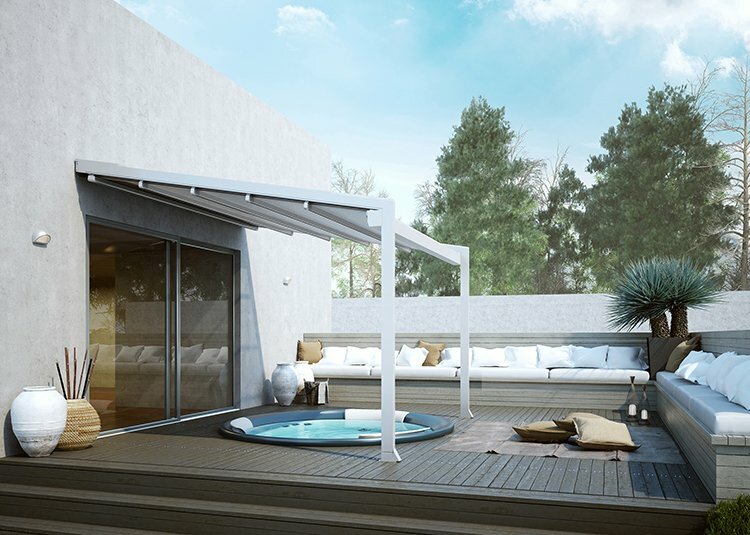 A new modular and complete shading system for the outdoors, these elegant structures are fabricated from unique designs in modern aluminium or traditional wood and encase a retractable Awning roof. 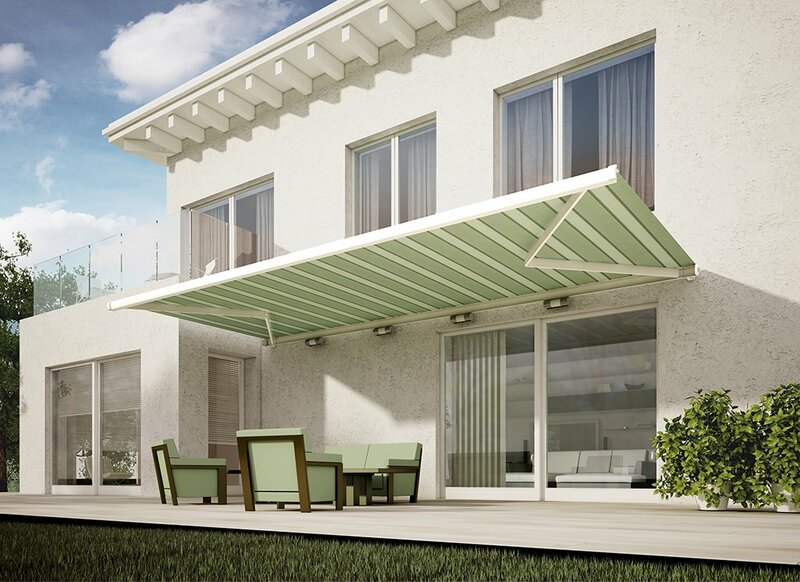 Combining the charm and beauty of pergolas, Gennius Awnings also demonstrate the technology and reliability you will expect from a Luxaflex product. The upper cover is a single piece of PVC which is resistant to all normal types of atmospheric agents. This Awning protects against the sun, rain and wind with the touch of a button, or the roof can be retracted to allow you to enjoy a beautiful day if you prefer. 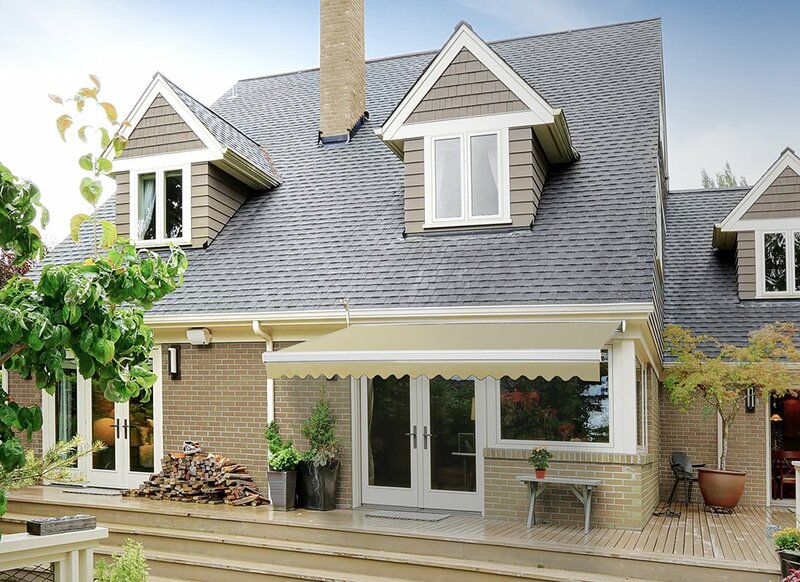 With optional retractable solar screens, you can completely enclose the sides for additional weather protection. 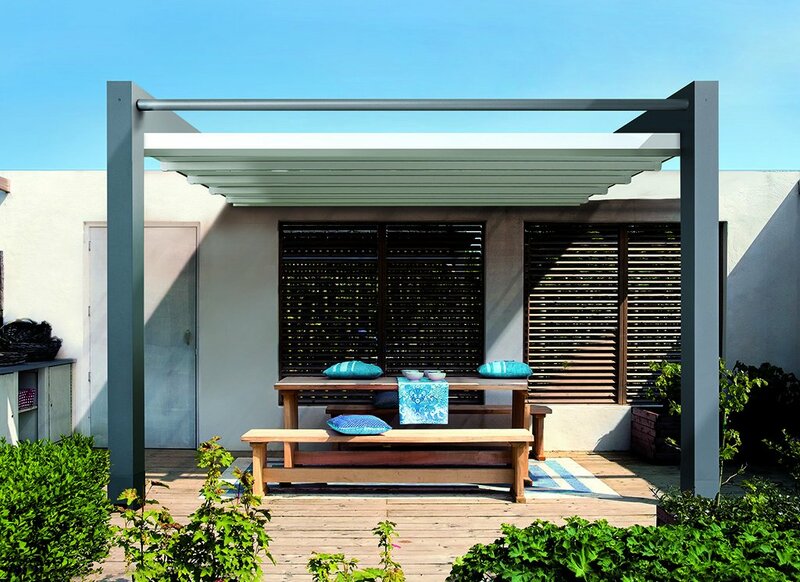 This sun-screening structure can be fixed to the wall or self-supporting, extending living spaces, create new ones without the construction costs of a permanent structure. 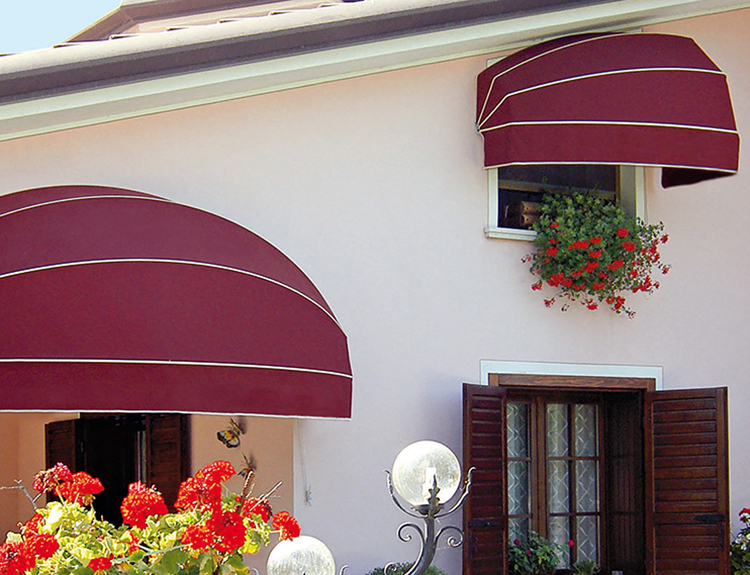 Luxaflex Canopies can be manufactured in a variety of shapes to compliment the architecture of your home or business premises. Choose from an array of fabrics and create a visual statement by having your details screen-printed or sign written across the fabric. Canopies are manufactured from high quality anodised aluminium with cast components. Generally they are covered with acrylic fabric that is secured to the frame by staples and hidden by PVC hideaway piping. 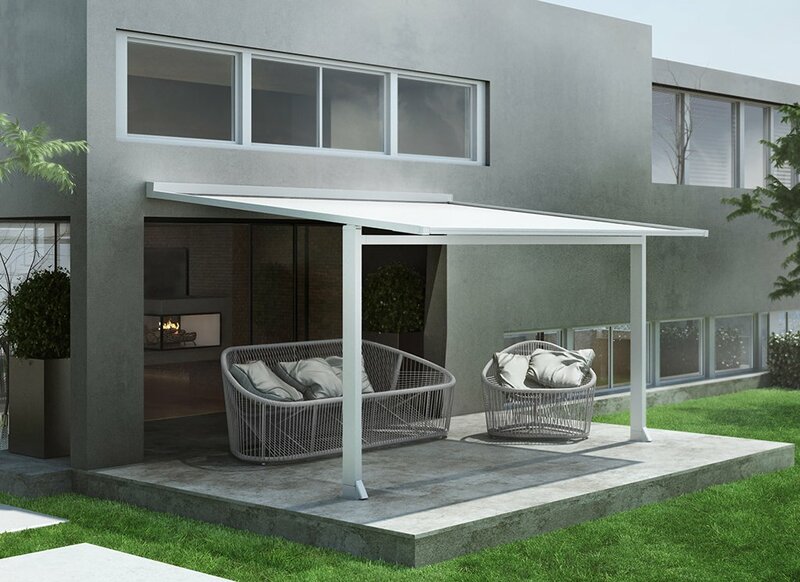 Depending on the Canopy shape the frames can be manufactured as fixed shape or retractable. As the old saying goes, quality counts quality matters, we pride ourselves on our obsession to detail, this is reflected in every single product we manufacture and supply, our homes are a reflection of us, so why settle for anything less. 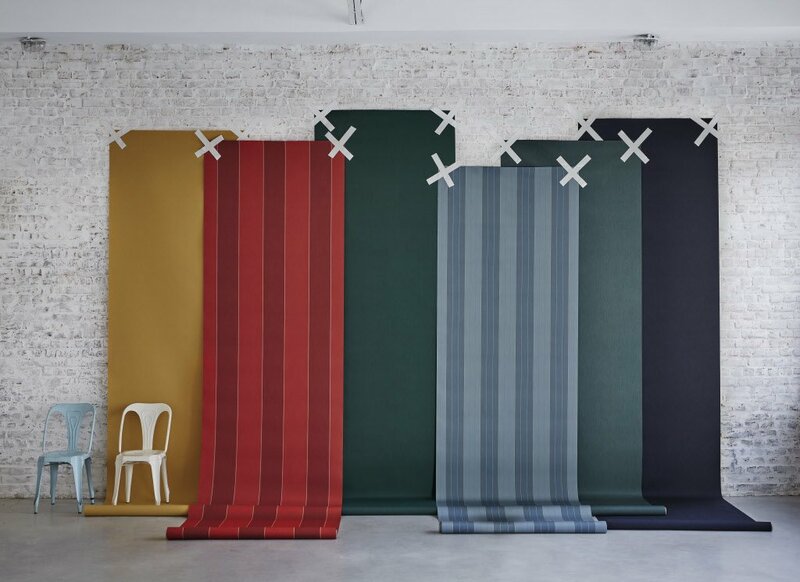 We offer a different approach to the window treatment industry, discover why we are rapidly taking the modern window Shade, Blind and Awning markets by storm, offering exclusive products you won't find anywhere else locally. Our ranges go far beyond standard window treatments, we have now entered the next generation of light control, and our systems and solutions cover every aspect of modern living including affordable smart products designed to simplify your life.